Over the years, Dale Earnhardt made Richard Childress look mighty good as a car owner. Now his son, Dale Earnhardt Jr. is indirectly helping to keep Childress from looking pretty bad. Earnhardt’s struggles at Hendrick Motorsports and his recent crew chief swap have overshadowed the struggles of Richard Childress Racing, a story that likely would be drawing much more attention if not for the Earnhardt saga. 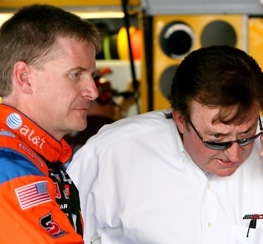 Childress, who has been able to put three drivers in the Chase in the past, now has four teams and only one driver, Jeff Burton, in the elite group. The RCR team is winless so far this season, but Burton has two third-place finishes this season, at Las Vegas and Richmond, and his average is 14.6. He’s 10th in the standing, but just 20 markers ahead of 12th-place Mark Martin. Clint Bowyer, who moved over to a new group at RCR when the fourth team was added, started the season fairly strong, with four top-six finishes in the first six races, but since then his best finish is an 11th last week at Dover. He left Martinsville, the sixth race of the season, second in the standings, 89 points behind Jeff Gordon. Now he’s 16th, 404 behind leader Tony Stewart and 118 out of the top 12. Kevin Harvick started the season with a runner-up run in the rain-shortened Daytona 500 then finished fourth at Atlanta a few races later. But his nose-dive has seen his average finish drop to 22.7, and he’s 24th in the standings, 306 away from 12th place. Newcomer Casey Mears has two ninth-place runs, at Richmond and Dover, but is averaging 21.1 and is 21st in the standings, 261 out of 12th. Childress announced at Talladega Superspeedway that he was swapping the crews of Harvick and Mears, but so far the results haven’t significantly improved, although Mears did get his only two top-10s since being teamed with Todd Berrier’s outfit. Burton, the guy who usually has an answer for everything NASCAR, seems stumped when trying to explain his own team’s struggles. He said that in the past the RCR teams did lots of mid-week, on-track work. NASCAR has imposed strict limits on testing this year in an attempt to save teams money. Burton did get a chance to work on that this week. He was part of a Goodyear tire test at Indianapolis Motor Speedway and also turned some laps at Virginia International Raceway to prepare for the upcoming road-course races at Infineon and Watkins Glen. But it’s not just a lack of testing that has the team in a multi-car slide, he said. In fact, as far back as the mid-point of the Chase last year, Burton acknowledged that their cars needed more speed if he was going to be a contender for the title. As it was he had all top-10s in the Chase races leading up to a win at Charlotte, where he left second in the standings. From that point on, he ended the season with finishes of 17th, 18th, 13th, ninth and 40th and wound up sixth in the stadings. Now that it’s clear that the team is off track, it’s time for more changes, he said. “We were able to take that assessment really early, and now we’re trying to do things differently, and we’re trying to get better during the year where some people got better during the winter,” he said. “We just made some decisions that weren’t ultimately the correct decisions. “It wasn’t because we weren’t working, it wasn’t because we weren’t trying, but we just made some decisions that didn’t work. Now we have to look at every department and try to figure out how to do every category better.